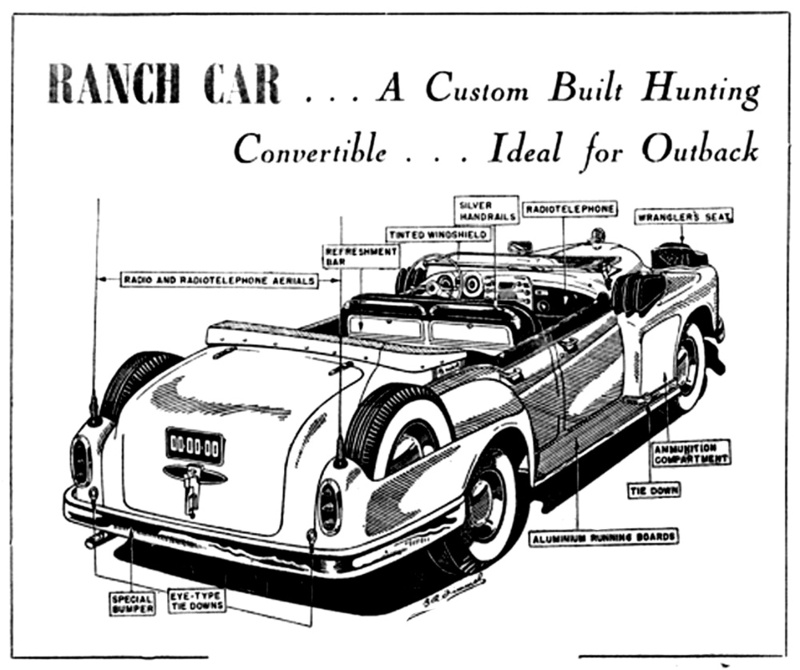 The kind of car everyone dreams about – a luxury job built to one’s personal specifications, was recently delivered to an American ranch owner. 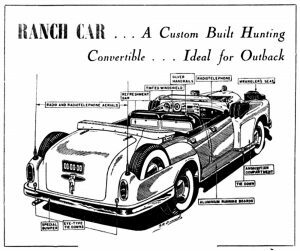 The car was engineered by the Buick division of General Motors and contains a number of interesting and useful features as our artist shows. twin spares, enormous luggage capacity, and two way radio are combined with rifle racks and built in winch gear to make the car capable of dealing with any situation. The car only faintly resembles a normal Buick, and was built up from a 1949 chassis with a reduced wheelbase. Chassis and body members are extra braced throughout to carry the extra weight. Axle shafts and steering gear were constructed of heavier gauge steel and a much larger radiator fitted. a special reservoir tank of 1&1/2 gallons keeps this supplied under extremely hot conditions. The 15 x 8.90 six-ply tyres are really light truck tyres, and the convertible top and side curtains are manual operated to save weight. Storage compartments are provided for ammunition, refreshments and first aid gear. The winch gear is mounted behind the radiator grille and is driven from the front of the motor through a special clutch gear and can be hand-cranked if necessary. It has a six ton pull and will easily pull the car out of bogs, sand etc. The instrument layout is interesting and features a rev counter, altimeter and compass, the radio equipment is also built into the panel. The engine is standard Buick Roadmaster straight eight and develops 152 b.h.p. at 3600 r.p.m. and a Dynaflow torque convertor transmission is also used, these being the only standard components in the whole car. Although no one has ever mentioned the price, you’re quite right, it’s not standard either!